FPC messages: compiler message like Error: Illegal enum minimum-size specifier. 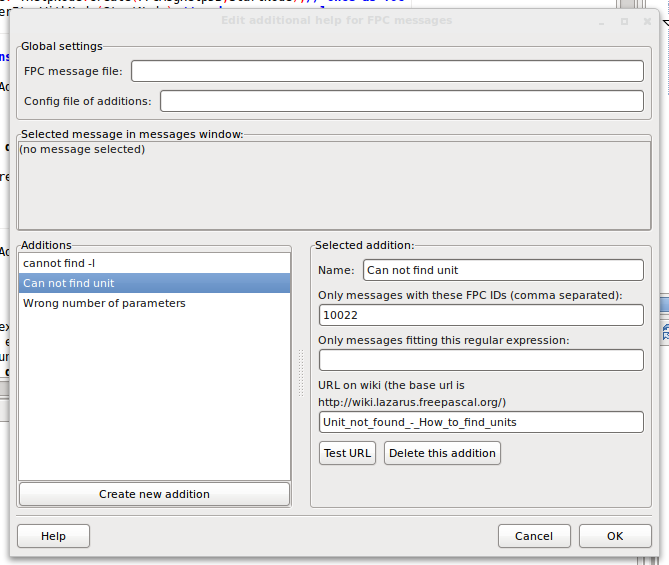 The IDE has a default built-in to search for the FPCSrcDir/compiler/msg/errore.msg file, search the message there and show the corresponding comment. The comments contain Latex tags which are stripped. At the moment a simple MessageDlg is shown. Some notorious messages need more explanation and are manually connected to URLs. You can see the currently installed help under View / IDE Internals / About IDE / Help. There is a test and demonstration package under examples/idehelp/demoidehelp.lpk. It contains example code how you can add help to the IDE. To show your help in the user's browser see examples/helphtml/htmlhelp1.lpi. To show HTML help in a LCL control see examples/htmlhelp_ipro/htmlhelpsample.lpi. Whenever the user presses F1 for an Object Inspector property or on an identifier in the source editor the IDE searches the declaration and invokes the HTML viewer for the fpdoc item. The items can be edited easily via the FPDoc Editor tool. You can see the state of the LCL documentation here: LCL Documentation Roadmap. This feature exists since 0.9.15. The help for the IDE windows (i.e. 'Object Inspector' or the 'Compiler Options') are documented in this wiki. 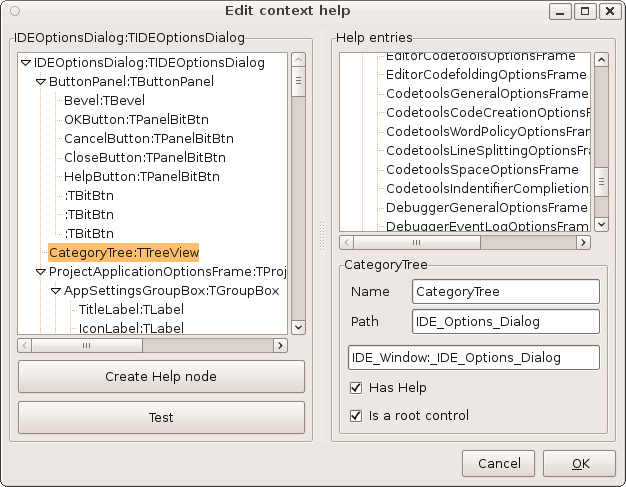 The IDE has a mapping file docs/IDEWindowHelpTree.xml, which contains the paths from the various IDE forms/controls to wiki pages. This mapping file is edited via an editor that is shown at any place in the IDE via Ctrl+⇧ Shift+F1, except for controls that catch all keys, like synedit. You can set the shortcut in the editor options -> key mapping. The root page of the IDE window docs is Lazarus IDE. To the left, you can see all controls of the project options dialog. You can see there are also the compiler options. Click Create Help node. This will create a new item on the right. Check Is a root control. All controls on the frame should use the help on our new help page. 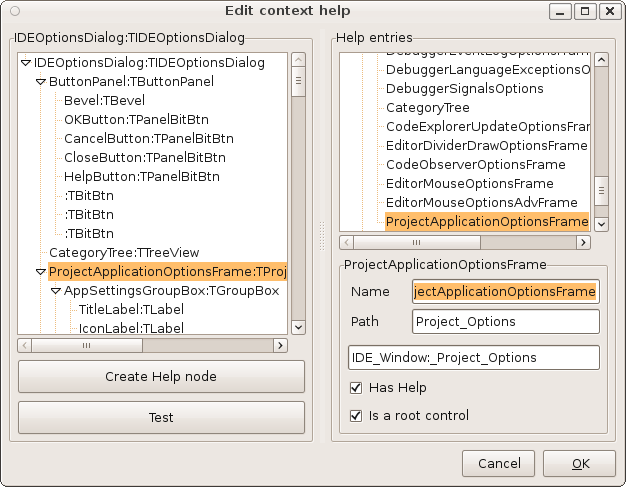 You can click the Test button and should see IDE_Window:_Project_Options in your browser. You can register a help for fpc keywords. Note: One database can handle multiple contexts, for example help for fpc keywords, help for sources and help for messages. // or whatever you like. This feature exists since 0.9.15 and requires the FPC sources installed locally. This is invoked when the user presses F1 or uses the Help menu item of the message window. This shows the editor for message additions. The items are stored in <lazarusdir>/docs/additionalmsghelp.xml. This page was last modified on 21 December 2018, at 23:41.